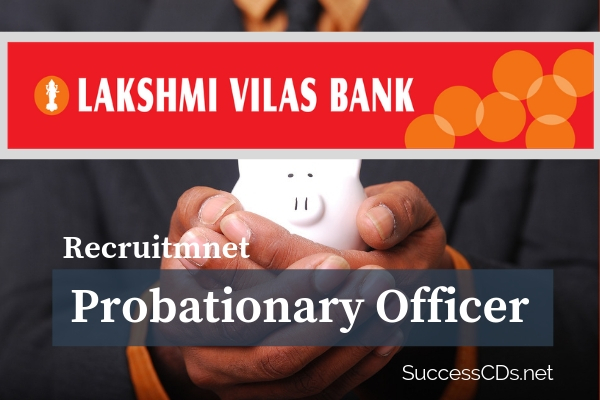 Lakshmi Vilas Bank PO Recruitment 2018 - Lakshmi Vilas Bank recruiting Various candidates to fill their Probationary Officers job in All Over India. Check more details from the page below about LVB Bank Vacancies 2018 eligibility criteria, important dates, application process, selection process, admit card, etc. Lakshmi Vilas Bank is offering you a best opportunity for getting into banking field. Aspirants, whose ambition is to serve in a well known bank, are asked to apply for the Probationary Officer position in this bank. The number of openings available in LVB is not revealed in the official notification. Note: Degree should be awarded by the University/Institution on or before 01st December 2018. Candidates awarded with CGPA/Grade should be equivalent to 60% (First Class) or more. Candidates will have to pay the exam fee online using Debit Card or Net Banking by furnishing the required details. Fee once paid will not be refunded under any circumstances. Candidates are therefore requested to verify their eligibility before paying the exam fee. This will be the final stage of online application process. The candidate shall read the “Declaration” text carefully before clicking on ‘Submit’ button. Candidates are requested to apply online only through careers.lvbank.com on or before 30th December 2018. No other means/modes of application are permissible. Graduates who are willing to apply for this banking job can use the official website www.lvbank.com of Lakshmi Vilas Bank for making your registration. Click here or more Bank PO Exams.